Measuring Roman Shades - BlindsOnLine.com Inc.
Never measure an old blind or shade to order a new one- it will not fit. 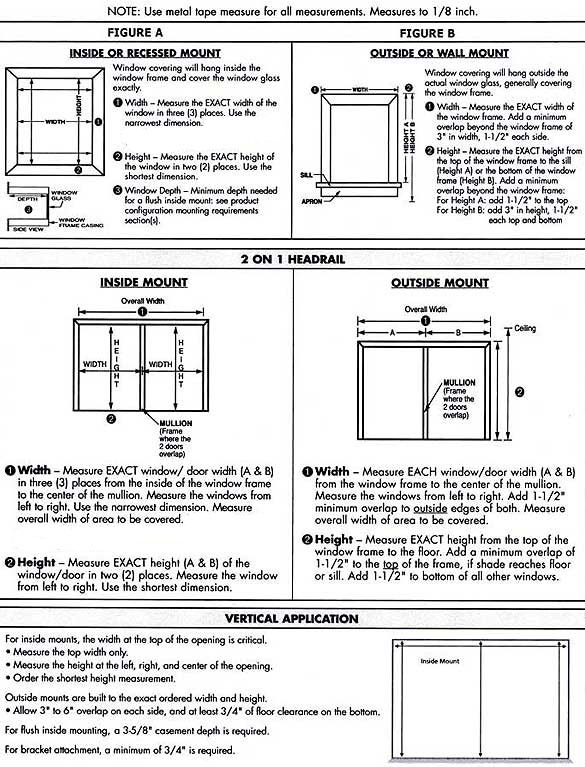 Always measure the window or door using the instructions for the product. 1) Measure only with a metal tape measure-do not use a yard stick or cloth tape measure. 2) Determine whether the roman shade will be mounted inside or outside the window frame. 3) Remember that width is across and length is top to bottom. 4) Double check the color name and number. 5) Review the samples prior to placing your order. 6) Know where you want the placement of the lift cord. 7) The order can not be changed once it is in the production stream. 8) When in doubt, call customer service. Inside Mount (figure A): For windows with 1” or more of depth an inside mount is recommended. For blinds to be completely recessed within the window frame a minimum of 1 ½” is required. If your windows are less than the minimum flush mount depths your blinds will project away from the window. Width- Always use a steel measuring tape. Measure the inside width in three places top, center and bottom. Supply us with the shortest of these three measurements rounded down to the nearest 1/8”. DO NOT DEDUCT from this measurement. Factory will deduct ½” from your measurement supplied for clearance. Height- Measure the inside height in 3 places left, center and right. Supply us with the longest of these three measurements rounded up to the nearest 1/8”. Factory will make no deductions. Outside Mount (Figure B): For windows with less than 1” of depth an outside mount is recommended. Width- Always use a steel measuring tape. Measure the width of the surrounding molding. This will allow the brackets to be mounted directly to the molding. For windows that do not have molding measure the inside dimension of the window frame and add 4” to this measurement. This will allow for a 2” overlap on each side for privacy and light blockage. If blinds are to be mounted next to a wall or any other obstruction adjust overlap accordingly so that blinds do not interfere with the obstruction. Height- Measure height form top of window molding to window sill in 3 places left, center and right. Supply longest measurement rounded up to the nearest 1/8”. For windows without a window sill supply measurement from the top of the molding to where you would like blinds to end (usually to the bottom of the lower molding). For windows without molding supply height from top of window to sill and add 2” for the mounting bracket.